MIAMI BEACH, Fla. - New test results show unacceptable levels of arsenic taint mountains of dirt the city of Miami Beach is stockpiling in a residential neighborhood. 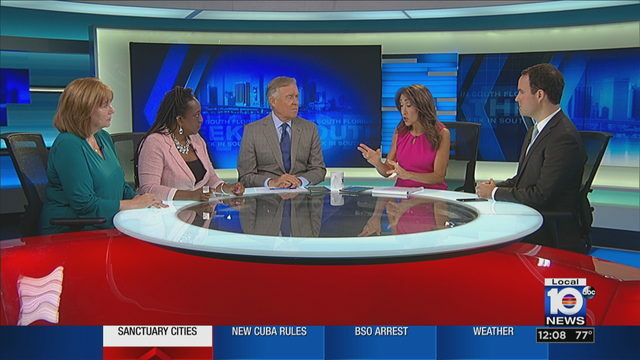 After homeowners complained about the smell of the sand and soil mounting on the Par 3 golf park in the Bayshore neighborhood, the city and Miami-Dade County environmental experts performed tests and retests. In addition to arsenic at about four times acceptable levels, the county found construction debris mixed in, including brick chunks, metal rebar and PVC piping. The dirt and soil comes from two main sites: Alton Road sewer construction under way by the Florida Department of Transportation, and a luxury condominium construction site at 34th Street and Collins Avenue. The city planned to use it in future public projects as a cheaper alternative to newly mined material. The discovery of construction debris prompted the county to demand the city remove it and scrap the plans. In an email response to Local 10 News, Miami Beach staffers said the material was determined to be clean by both sources before its delivery. Still unanswered: how construction materials came to be mixed in upon delivery. The Faena condo developer, and contractor for FDOT paid for the transportation of the material to the Par 3 site and, according to the city, will be covering the cost to remove it. The county halted removal until an acceptable disposal site can be located. Homeowners in the Bayshore neighborhood were notified by representatives of their neighborhood association of the testing and results. A city staffer, via email, addressed the concern over the high arsenic level by writing, "...there will be no negative effects...," explaining that arsenic is harmful only if ingested in large quantities over a period of years.